HD quality is your primary option since it brings you with better immersive experience in video/movie viewing. However, when it comes to convert HD video (1080p/720p) format, the output quality would get visually damaged. How to transcode HD video without losing quality? Find the answer in the below post. With HD camcorders becoming more and more pervasive, HD videos like AVCHD M2TS MTS MKV gain a foothold accordingly. But HD 720P or 1080P resolutions means more data which requires larger amount of space. As a result, we need to convert HD videos for easier sharing and storage. Therefore, we will need a tool that is able to convert HD videos to other formats and smaller sizes without quality loss. Generally, HD 720P and 1080P videos have more data than SD videos. Therefore, there are many users complaining that converting a high-defintion video takes too long. Yet some others want to keep the crisp image quality of the HD videos. With the right Mac HD video converter, you can enjoy the seamless HD video conversion ability, high-quality video outputs, fast conversion speed and maximum easiness. Below we'll recommend you such software based on our tests. Any formats to choose from? The converting software for HD and even 4K UHD we test here is MacX Video Converter Pro, which is reviewed as "This Mac video decoder features the unique ability to convert Multi-track HD videos in the format of M2TS, MKV, AVCHD, HDTV BDAV and MPEG-TS" from MacLife editor. This software gives you thorough control over any SD videos and HD videos in 1080p, 1080i and 720p, even 4K 8K Ultra HD video from HD camcorder Sony, Panosonic, Canon and more. You can transcode HD HEVC, MP4, AVCHD, MTS, M2TS, WMV etc. among any digital formats and devices. The best part is that the software turns out to be extremely fast (literally industry No.1 fast) to deal with HD videos, while the output videos look no different to the original in quality. 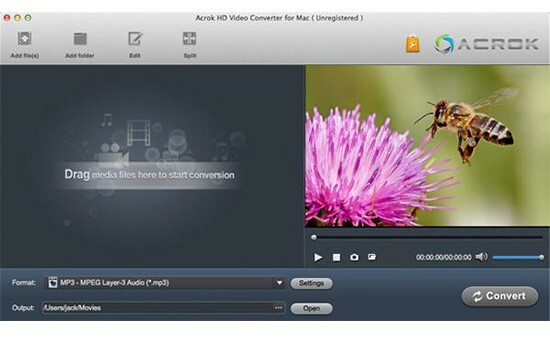 MacX Video Converter Pro is the first Mac HD video converting tool that offers support for the three major hardware acceleration tech - Intel QSV, Nvidia Cuda/Nvenc, AMD in the whole conversion. That is to say, from HD video decoding, processing to encoding, the whole process will be carried by the GPU not CPU. GPU is dedictaed to processing graphic intensive tasks, therefore it's faster than CPU. The 3-Level Hardware, as the developer named, delivers World's Fastest speed, up to 5X faster speed compared with other competitors. It's worth mentioning that Digiarty has optimized the hardware acceleration for UHD 4k and HD format HEVC H.265. Comparatively speaking, there are many programs on the market that offer support for GPU acceleration too, like Handbrake. But they support only one acceleration tech, like Intel or Nvidia, or they take advantage of GPU in a single stage only. Without the advanced hardware acceleration tech, the HD video conversion mainly relies on your Mac computer's hardware configuration (more powerful graphics processing unit, multi-core CPU, internal memory, hard drive, etc.) to accelerate the HD video conversion speed. That's why the computer heats up easily when converting a HD video. For example, when converting a 4K 60FPS mp4 video, Handbrake takes 14 minutes while MacX Video Converter Pro uses 2 minutes only. It's pain if the fast speed comes at the cost of video quality. As crisp picture quality is the basic feature of HD 1080P/720P videos, any video processing software for Mac is essentailly useless if it can't produce users with a High Quality ouput video. So the best Mac HD video converter software shall convert a range of SD/HD files in a quality that is both unequalled and unmatched. Third, the Upscaling tech can upscale SD to 2K and convert HD videos to 4K resolutions, offering even better quality. HD videos like AVCHD M2TS MTS MKV are made only for specific device, which causes many playback problems. Whether you are an Apple fan or an Android enthusiast, you want to make utmost use of your gadget for sure. Accordingly, people are prone to take supported devices into consideration when finding the best HD video converter for Mac. MacX Video Converter Pro has a massive library of up to 370+ codecs for the popular formats like HEVC, H.265, H.264, MP4, MKV, AVI, MOV, WMV, FLV, 3GP, and others. Jammed with as many as 420 supported mobile devices, you can easily convert incompatible HD formats to mobiles without knowing the codec stuff. Be it iPad Mini 4/iPad Pro/iPad Air 2, iPhone Xs Max/Xs/XR/X/8/7/6S/6S Plus, Samsung Galaxy S9 edge+/Note 9, HTC 10, PS4, PSP, Xbox One, Microsoft, Google, Balckberry, Nokia, etc, just one click with the best Mac HD video transcoder for mobile. Take the two other converters which we will talk about in this article below for example. 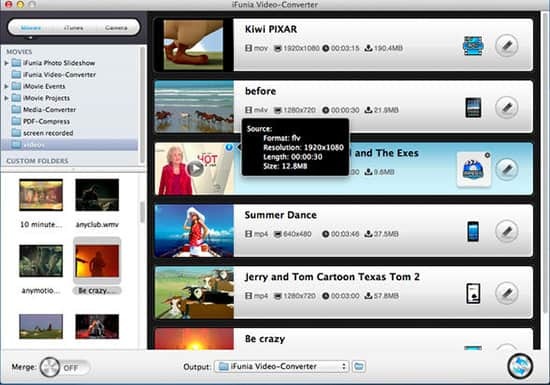 The official list of preset profiles iFunia video converter for Mac supported covers the common used iPad, iPad 2, The new iPad, iPhone, iPhone 4S, iPhone 5, iPod, Kindle Fire, Xbox 360, PSP, PS3, Android Phone, BlackBerry, Windows Phone, Symbian Phone, Samsung, etc. older Apple or Android devices, no the latest flagship device like iPhone Xs, iPad Pro, Galaxy S9 edge added in. One highlight worth a mention is that it includes the music player like Walkman, Zune, Palm, Creative ZEN, Sansa, ARCHOS, iRiver, etc. for music lovers to choose. Similar to the above iFunia Mac HD video converter, the HD video file converter Mac version from Acrok is also lack of the latest Apple and Android handheld device profiles. If you are not hurry to convert and transfer video to iPhone (iPhone Xs/Xs Max/XR) or iPad Pro, you could take it. Thankfully, another two HD video converting tools for Mac are also friendly to users, simple mouse clicks needed. Taking Acrok HD Video Converter for Mac for instance, 100% no need to refer to any tutorial or support, the intuitive interface has already told you how to achieve HD video conversion. Video converter software usually comes with the same features, letting you convert one video file to another format that can run on your mobile devices. But the triumph card of this HD video converter for Mac that claims to be the best one lies in the built in useful features. It is capable of making photos to a slideshow video with any type of background music as you wish. Better still, it also equips itself with YouTube HD downloader, streaming video recorder, video editor and HD video compression software, whereupon you can free download video music from 1000+ video sharing sites and convert media files to iPhone iPad Android devices suitable file size and high qualtiy for offline watching when you are in a place without Wi-Fi. The rest two Mac video transcoders focus on HD video conversion, no video downloading, video recording or slideshow making features. But they still win dozens of users' heart with their simplicity, 2D to 3D conversion and sincere service. As 2014 TopTenReviews Gold Award winner in software for converting reviews, it can't be underestimated. It supports you to convert HD videos on Mac with virtually all types of, MTS, M2TS, MKV, AVCHD and more in 720p or 1080p to HD, SD videos and audio formats, even including converting 2D to 3D video. If there is any downside to this particular video converter for Mac, it's that it can't convert 4K/8K Ultra HD videos and HD video to H.265 HEVC format. The operating system requirement is based from Mac OS X 10.6 to 10.11 El Capitan. How about the third one? It is aimed to just offer what you need, no more additional features provided to bother you. See, it just does HD video conversion stuff, with almost any HD video file from HD camcorder supported, MTS/M2TS/TS (AVCHD H.264, VC-1, MPEG-2 HD) to MP4 MOV AVI FLV WMV SWF, etc. 100+ video and 15 audio formats. There is one annoying aspect about this top HD video converter for Mac: it has a snail speed in product updates. To be specific, it's unable to convert 4K Ultra HD videos, let alone the H2.65 HEVC videos. What's worse, if you purchase the MacBook or upgrade macOS to the latest macOS Mojave, sorry to inform you that your Mac converter from Acrok doesn't catch up with these, yet. Transcode HD video to MOV, MP4, H264, HEVC, etc. 180+ formats.